I don’t know about you, but I have so many childhood memories of playing with my friends and our Barbies. My mom played with Barbies when she was young, my friends and siblings all played with Barbies and now my daughters get to enjoy them too. They have many dolls, accessories and movies. 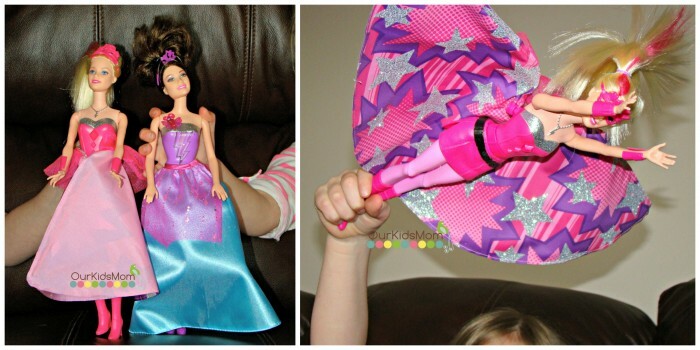 There was definitely excitement in our house when we heard there would be a new Barbie movie. That excitement grew when we found out that the new Barbie movie would feature Barbie as a super hero. Growing up with an older brother has given them an appreciation for super heroes. Barbie in Princess Power happens when Princess Kara is kissed by a magical butterfly which gives her super powers. She transforms into Super Sparkle to protect her kingdom with some help from her friends. The Super Sparkle doll has a cape that turns into a skirt by twisting her legs and then turns back into a cape by pressing a gem on her chest. This was a really fun feature. The Super Sparkle doll aslo comes with wrist cuffs, boots, a necklace and a super hero mask that doubles as a tiara when Super Sparkle is Princess Kara. While one of my girls will be Princess Kara, the other will be Princess Corinne. Princess Corinne is also kissed by the magic butterfly and receives super powers. The Princess Corinne doll comes with the magic butterfly on her shoulder and a tiara. Press on the butterfly and you will hear it deliver the magic kiss and a lightening bolt on Princess Corinne’s gown flashes. Of course no Super Hero movie would be complete without the reporter. My girls have been having fun with the well dressed reporter doll and creating new super stories of their own using the dolls from the movie. I love watching them play together, enjoying the same things I did at their ages. I know they are now getting the chance to create memories of their own too. You can find out more cool info about the movie and other BeSuper activities right here. 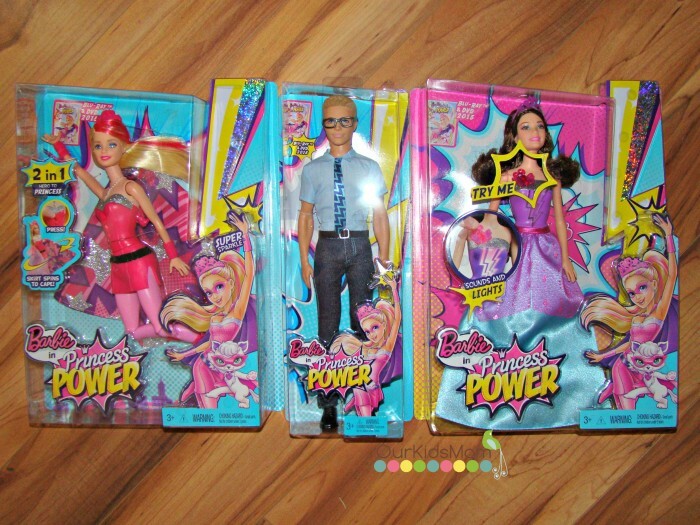 I noticed at Toy Fair in February that all the traditional “girls” toys have a superhero vibe or an empowering focus. It’s about time! Oh, I am so jealous! Can you believe I never had a Barbie? (Except for a hand-me-down one from my cousin that was broken). Just cheap knock-offs – and I never had nice clothes for her. Is it too late now???? Oh, the memories! 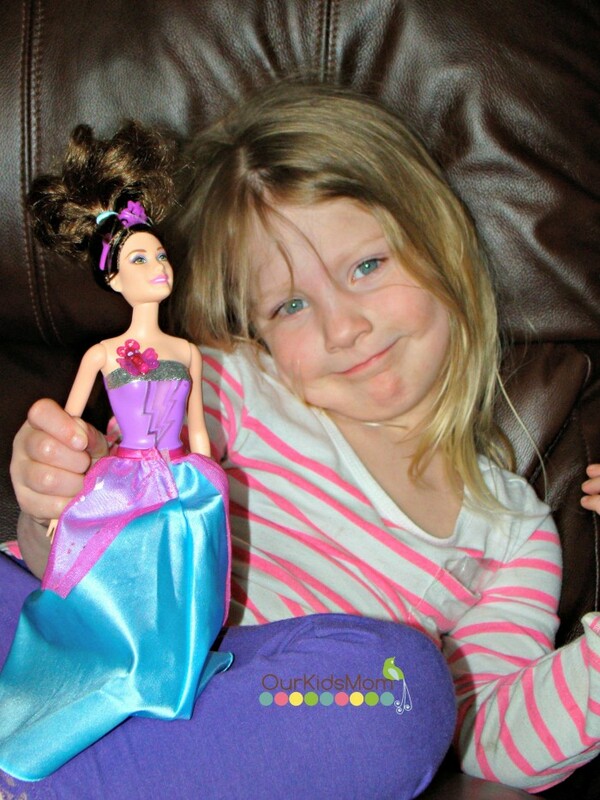 Used to love playing Barbie … great keepsakes in this post! Very pretty dolls, so sparkly, and love the light up feature, my girls love when the dolls light up or make sounds. Have to have Clark Kent. No, wait, he turned into Superman….?? ? What great new dolls. Barbies are so much fun to play with. Nice to her as a super hero.